School last night was interesting. 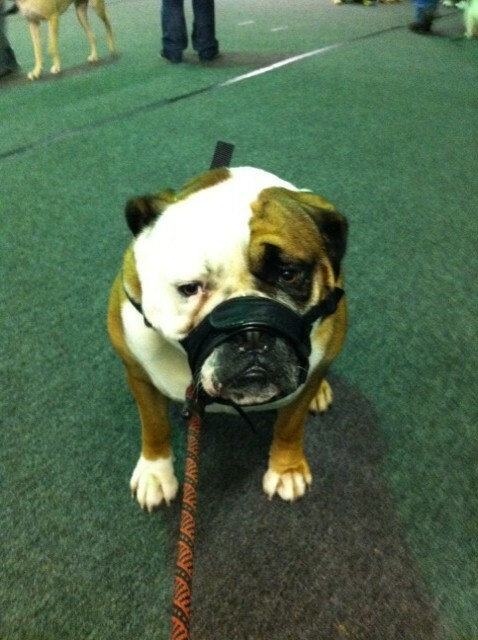 Pablo had to wear his muzzle the whole time, and he HATED it. Despised it. It squished his nose, and squinted his eyes. He was not a happy boy. It was frustrating for me because he wouldn’t move. All he did was sit in front of me, stare at me, and pout. The good thing is that he didn’t even pay attention to the other dogs, so it was a big step for him to not be bothered by strange dogs, BUT he wouldn’t even really do the exercises (walking by dogs, sniffing dog butts). I had to literally drag him. Ugh. He was very happy to get that thing off his face and get home. I reminded him that if he wasn’t such a jerk, he wouldn’t have to wear it. Maybe he understood? 5 mile run yesterday (on the treadmill…yuck), and 6 mile run today (on the treadmill…yuck). Big runs this weekend: 5 mile run Saturday, and 10 miles on Sunday! Probably in the rain, too…fabulous! Yoga Monday night was good. Really hot and challenging, but good. I missed the 6:30 class due to really bad traffic, but made it to the later class, and was so glad I went. 6, 1/2 mile, sprints last night. It was dark, slippery, cold and wet, but I still ran fast. Pablo has school tonight! We are looking forward to it. Week 8 of training begins this week. Lots of miles this week. I signed up for the GRE prep class today. I start right after I run the half marathon. It’s twice/week for the month of December. I will then take the GRE right away. Ugh. I also am starting the application for grad school. Exciting stuff! Speed training last night. I ran 3, 1 mile, sprints, and I was fast! WOW! All under 7 minutes. I felt like I was going to throw up after each mile, and as I was running I wondered why the hell I was doing this to myself, but I still did it, and I did it fast!